QUITAQUE — The first of what is expected to be a healthy crop of baby bison was born recently and up to 25 more of the shaggy critters will likely join the historic herd at Caprock Canyons State Park this spring. The growing bison herd, which now numbers 85, has almost doubled visitation to the sprawling Texas Panhandle park, where the Western icon can be viewed up close, according to Superintendent Donald Beard, who hopes to expand the bison range to all but 2,500 of its 15,000 acres later this year. In the fall of 2011, the Texas Parks and Wildlife Department released the state bison herd from a 300-acre area of Caprock Canyons State Park to roam more than 700 acres of restored native grass prairie near the Visitor Center and Theo Lake. TPWD has been raising funds for additional fencing, mesquite eradication and prairie restoration the past couple of years by sponsoring public events at the park and in nearby Quitaque, including a music festival headlined by Asleep at the Wheel. The Caprock Canyons bison descend from the legendary Charles Goodnight herd that saved the Southern bison from extinction in the 19th century and supplied wild stock for Yellowstone National Park and some of the nation’s largest zoos and ranches. Caprock Canyons State Park is located about 50 miles northeast of Plainview on FM 1065 approximately 4 miles north of State Highway 86. For more information, call (806) 455-1492 or visit the TPWD Website. Did you know that birding is the most popular sport in the United States? Over 51 million people bird-watch in their backyards, state parks and even at birding competitions! April is a great time to get outdoors with your family, and birding is an activity the whole family can enjoy — even while hiking, biking or picnicking. Texas has over 630 species of birds (second most species next to California), and Texas state parks are some of the best places to view birds in their native habitat. 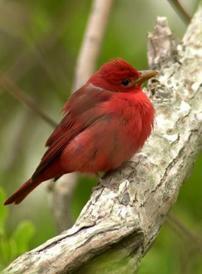 And many parks host guided bird walks, workshops and other birding events. Visit the calendar to find a birding event near you. Before you head out, share this "Introduction to Birdwatching" PDF with your family to learn what to look and listen for. You can also download a colorful PDF called "Texas Birds: Introducing Texans to Common Birds" to take with you. And watching this month’s featured video, "Basics of Birding," will give you an overview of what you should bring and what you can expect on your family birding adventure. From observation platforms to enclosed shelters and traditional birding blinds, these parks offer optimal perches to experience some of the best birding in Texas. 16 other Texas State Parks and state natural areas are in the Austin area. 20 other Texas State Parks and state natural areas are in the DFW area. 7 other Texas State Parks and state natural areas are in the Houston area. 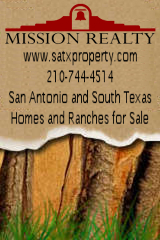 18 other Texas State Parks and state natural areas are in the San Antonio area. The World Birding Center — encompasses 9 locations in the Rio Grande Valley, including three state parks: Bentsen-Rio Grande Valley State Park, Estero Llano Grande State Park and Resaca de la Palma State Park. These areas play host to bird species that can be seen almost nowhere else in the United States — so plan your trip today. Wing it – Visit a state park with a birding checklist and see what you can find. Make it part of a picnic or hike. 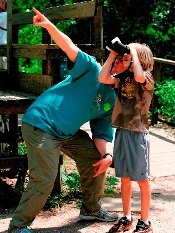 Attend a state park birding event – Check the Birding Events Calendar to learn where and when you can bird with a group or a park ranger. Enter the Great Texas Birding Classic – The State Park category is open to all ages of park visitors, as well as park employees. Teams of 3-5 birders select a state park to bird from and a date that fits their schedule during the Birding Classic tournament from April 15-May 15. Teams spend a single day in the park identifying as many birds as possible. The team that IDs the most species wins and gets to select a project that will receive a conservation grant. The Registration deadline for participating teams (all fees and forms are due) is April 1. Watch a video to see what it's all about. Birding builds an appetite so don’t forget snacks or a picnic. 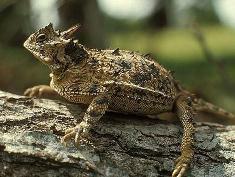 Now that we’ve got your attention − make that Barbecue cook-off, honoring Texas’ iconic and threatened horned lizard. Head out April 25-26 to Copper Breaks State Park, northwest of Wichita Falls. This annual cook-off caters to Texans’ obsession with BBQ and our love of the state’s beloved little toad. No horned lizards will be harmed at the event, but some will be in attendance. Watch this park video to find out what else there is to enjoy in the park. Show up to learn more about our favorite lizard and eat some 'cue, or enter the cook-off which is sanctioned by the Lone Star Barbeque Society.